One of the longest, most complicated, and most befuddling free agent sagas in recent memory has finally come to an end. More than a week into the start of spring training, catcher Matt Wieters has reportedly agreed to sign with the Washington Nationals. 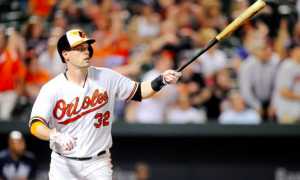 The deal is reportedly worth $21 million over two years, with Wieters making $10.5 million each season. However, Wieters does have the power to opt-out of the contract after the first year and return to the free agent market next winter. The Nationals were long considered among the favorites to sign Wieters, although there were conflicting reports about how much interest Washington had in him, especially after trading for Derek Norris earlier this offseason. The Tampa Bay Rays reportedly made a formal offer to Wieters in recent days, but it seems that it did not meet Wieters’ salary demands. Instead, he ends up with the Nationals, a team linked to the catcher for much of the winter. Despite a drop in his offensive numbers last year, his first full season since undergoing Tommy John surgery, Wieters has long been one of the better offensive catchers in baseball, which is what made him attractive to the Nationals. Washington received large amounts of production from catcher Wilson Ramos last year, and so Wieters replacing him as the team’s primary catcher will help the Nationals avoid a steep drop off in production at that position. Of course, there are reasons why the Nationals were reluctant to sign Wieters earlier in the offseason. There have been past reports that the Nationals were not fans of Wieters’ defense behind the plate, despite the fact that he’s a two-time Gold Glove winner. There are also concerns about his diminishing offense, particularly against left-handed hitters. Nevertheless, the price to sign Wieters dropped to a point where it became difficult for the Nationals not to make an effort to sign him. Washington is a team in win-now mode, and so the opportunity to bolster an already powerful lineup was too good to pass up, even if it carries risks. With the addition of Wieters, however, the Nationals must now deal with the excess number of catchers on their roster. Aside from Norris, the Nationals also have backup Jose Lobaton and prospect Pedro Severino in the mix. Severino could return to triple-A if necessary, even though the Nationals appear to be quite high on him. But with Wieters on board, it’s unlikely there’s room for both Norris and Lobaton, which could force Washington to part with one of them, possibly in a trade. Oddly enough, an excess amount of catchers may help the Nationals rekindle trade talks with the Chicago White Sox involving closer David Robertson. The Nationals are without a closer and have been linked to Robertson in recent weeks. The White Sox could use a catcher, and there are even reports that Chicago has been waiting for the Nats to sign Wieters to renew talks. Either Norris or Severino, possibly both, could be trade chips to help Washington land Robertson, although it will take far more than a catcher or two to trade for Chicago’s closer. There’s no guarantee that the signing of Wieters will work out for the Nationals, who are hoping he will help them reach the World Series over the next two years. But he does open up a number of possibilities for them, and for a team that’s in win-now mode, it’s a risk worth taking.